The following was written by Satoe Sakuma, CRA Eben Tisdale Fellow. Robots mimicking the form of insects have been making headlines recently. This May, researchers from UC Berkeley who are developing cockroach inspired robots presented their research at the IEEE International Conference on Robotics and Automation in Stockholm, Sweden. The paper describes how the researchers developed a springing mechanism that allows the robot to “jump” more than a meter in the air. Click here to see the bug in action. 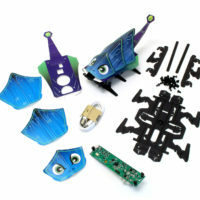 In 2013, Ph.D. engineers from UC Berkeley formed Dash Robotics and created Kamigami, tiny programmable robots in the shape of cockroaches, to be “a great educational tool for kids that want to get an early start in robotics, engineering, and biology.” Although Kamigami was built for children, it is highly entertaining for all ages as the cockroach robots can be programmed to fight, race, and communicate with each other. The insect inspired, six-legged robot comes as a flat-packed and laser-cut sheet that you fold like origami and secure together with rivets. The assembly process does not require any tools, glue, or tape and surprisingly, Kamigami takes less than an hour to build, which makes it a great parent-child activity. The plastic composite “is frictionless, which means that the robots are more efficient, not having to expend energy to counteract the friction of its own body parts rubbing together,” and can withstand large falls without being damaged. Not only is the Kamigami fun to build and drop from crazy heights, it is compatible with iOS and Android apps that gives you the power to test out some of its fantastic features such as laser tag battles, joy stick driving, light detections and many more. They are designed with infrared emitters and detectors that allow the colorful cockroaches to communicate with each other. Meanwhile you can command these robots through Bluetooth within the range of 100 feet. The interface displays a simple drag-and-drop that allows you to easily manipulate the rapid creatures. Read an overview by Chris Wood at Gizmag.com here. Kamigami is perfect for testing out your engineering skills and satisfy that robotics fervor you’ve always had. Since the team reports that it is designed to run like the world’s fastest animals, make your Kamigami race, fall, and battle till the death. When they run out of steam, just recharge and repeat for endless hours of fun. You can check them out at http://kamigamirobots.com/. CRA encourages the growth of the pipeline of future computing researchers by getting youth excited about science and engineering projects. Earlier this year, CRA participated in an exhibit focused on engaging youth in robotics and circuitry at the AAAS Family Science Days, held in Washington, D.C. CRA staff along with two representatives from Chibitronics presented the Circuit Stickers Project, where participants got to create, craft and code a light-up card with LED circuits.